Apple scored 807 in index ratings, under Netflix's 829, Hulu's 821, and VUDU's 810, the market research firm said. Points were calculated based on responses from 3,928 people between June and July, who were polled about factors like cost, content, ease of use, and customer service. Speaking to AppleInsider, J.D. Power noted that iTunes did poorly mostly because of complaints about cost and customer service. iTunes only supports purchases and rentals —while Netflix and Hulu don't offer downloads, subscribers to them can watch anything they have available for less than $10 per month. Another factor though was content, as Netflix and Hulu have exclusive shows like Stranger Things and The Path. 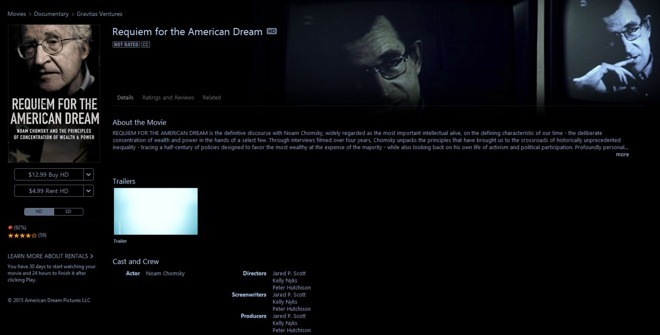 Apple's content library is fairly comprehensive, but limited to what studios and TV networks are willing to provide. Apple has sometimes been rumored as delving into live TV streaming and/or original programming, but so far the latter has only generated material for Apple Music, and its live TV efforts have been stalled in negotiations.